Success in massage therapy begins with a solid foundation in the fundamentals! 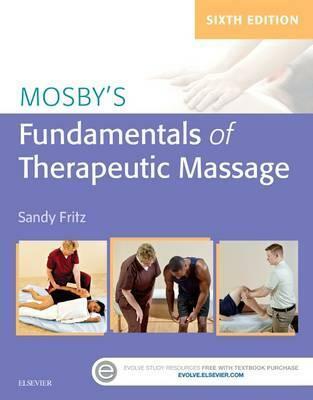 Mosby’s Fundamentals of Therapeutic Massage, 6th Edition helps you build the skills you need, from assessing problems and planning treatment to mastering massage techniques and complementary bodywork. Case studies bring concepts to life, and guidelines to professionalism include topics such as ethics, legal issues, and best business practices. ‘How-to’ videos on an Evolve companion website demonstrate manipulation techniques, body mechanics, positioning and draping, and more. If you want to prepare for certification exams and succeed in practice, this resource from massage therapy expert Sandy Fritz is your text of choice. Research Literacy and Evidence-Based Practice chapter includes new research findings and explains how research is done, and how to read and understand it. Comprehensive coverage includes all of the fundamentals of therapeutic massage, including massage techniques, equipment and supplies, hygiene, working with special populations, and business considerations; it also prepares you for success on the National Certification Exam (NCE), the National Certification Exam for Therapeutic Massage and Bodywork (NCETMB), and the Massage and Bodywork Licensing Examination (MBLEx). Over four hours of video on Evolve demonstrate techniques and body mechanics – each clip is narrated and performed by author Sandy Fritz – and include a demo of practice management software.ï¿½ An entire chapter is dedicated to case studies which offer practice with clinical reasoning and prepare you to address common conditions encountered in professional practice. Step-by-step, full-color photographs demonstrate massage techniques and protocols by body area. A workbook/textbook format facilitates study and review with matching exercises, fill-in-the-blank questions, drawing exercises, and critical thinking questions. Coverage of body mechanics helps you to create an ergonomically effective massage environment and to determine appropriate pressure, drag, and duration application while applying massage methods. A spa chapter describes the massage therapy services offered at spas and looks at the spa as a possible career track in massage. Adaptive Massage chapter explains how to address the needs of specific populations, from pregnant women and infants to hospice patients and people with physical impairments. Example boxes reinforce specific concepts by showing real-life situations. Coverage of multiple charting methods helps you develop record-keeping and documentation skills, including SOAP and computer charting with simulation on Evolve. Foot in the Door boxes outline the professional skills expected by prospective employers. Learning features include chapter outlines, objectives, summaries, key terms, practical applications, and workbook sections. In-depth HIPAA coverage shows how to store records in a HIPAA-compliant manner and describes HIPAA requirements and training. NEW ELAP-compliant content ensures that your skills and knowledge of massage therapy meets the recommendations of the Entry-Level Analysis Project. NEW Focus on Professionalism boxes summarize key information about ethics and best business practices. NEW Mentoring Tips provide practical insight into important topics and on being a massage therapy professional. NEW Learn More on the Web boxes in the book and on the Evolve companion website suggest online resources for further reading and research. NEW Quick Content Review in Question Form on Evolve reinforces the key material within each chapter and increases critical thinking skills. UPDATED content keeps you current with the information needed to pass your exams and succeed in practice.